That doesn't change anything, it's useless cosmetics. Honestly, would you prefer needing the gold to buy the better rifles, the ability cards or the fishing accessories and having the color of your guns, the style of your boots and the design of your saddle be locked behind real life money? That would be just pay to win and i wouldnt be here because i wouldnt play the game. We can be happy we can buy clothes with cash,right? I get the argument for having gold used for this feature, but it's a bit over the top that it can go as high as 30 bars just to customize the metal on your gun, I think it should just be a flat gold fee of 1-5 bars based on the most expensive metal selected, maybe add 50 nuggets per additonal piece changed. My honest belief is the gold is going to make the gambling a reality in the game, something many wanted but never received with GTA. This was they can separate the gambling monies from those purchased with real money and allow those games into the world. because someone made the point that some people dont have good tv's or good systems to play on, my point was i have that stuff and I'm still expected to buy stuff in a game I already paid 100 euro for, to have access to a base game fetaure. Its ridiculous. Welcome to 2018 where technology of games is better then it's ever been and AAA game companies gouge you at every corner. Could you imagine the games we would get if companies focused more on the art and less on their profits. I still don't follow... people without good tv's or systems what... don't deserve to have the unlocks be easier to access? Or is that they can't see the unlocks as clearly so they aren't as necessary? I actually prefer for gun metals and engravings to be expensive, so there will be less sh*tters running around with ugly guns. If someone is really determined to customize their weapon they will eventually get there. Who says it won't end up being purchaseable with both gold and cash? People who support MTX are the reasons R* (for one) have been continuously updating an otherwise free online game for 5 years. Sick or hearing the bitching about MTX and paywalls. Run an MC or buy a shark card. It's not hard. Yes they advertise by way of phone calls, emails etc but you aren't forced. It's no different to real life targeted ads on YouTube or Facebook based on your online activity. Buy it or don't. They aren't stealing your bank details. Agreed! A gold-plated gun should be a status symbol, and not a common sight. Given that each gun has 6 components, and each component costs 5 Gold bars to gold-plate, that's 30 gold per gun. Since the effect is purely cosmetic, I think it's a fair price. Personally, I plan to fully gold-plate my Pump Action and my Lancaster. Probably a Mauser too when I get one. 30 goldbars is fair? Lmao. In singleplayer you bought the metal once and could use it for all parts,thats how it should be for online as well. Its also not only gold,every material can only be bought with gold. People defend this because without additional income, Rockstar wouldn't continue to support and improve the game. There are a lot of ways for them to milk us of money, and of all the ones I can think, the method that is most likely to get money from people and is the while being the least obtrusive to the players is making people who want a gold plated gun be forced to pay cash for it. 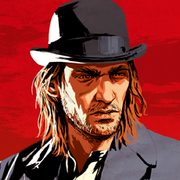 Maybe we should have to pay $15.99/mo to play and get everything for free, but personally, that would be I'm not an RDRO player anymore. You can either pay to play, pay to win, or pay to look hawt. I prefer the last option. So far they added nothing new,we all paid a lot of money already. Like i said,to me it feels fishy to have to grind for ages for stuff that i get for nothing in singleplayer. Sure, if it only affects how the gun looks, and not how it performs, then I think having to pay premium currency is acceptable. And plus, I don't need to put gold on every part of the gun immediately: I'm fine with that being a long-term goal, but I guess I can understand how others may want it all right away, however. This is one place where buying something with real money makes no sense at all. Paradoxically, its reasonable for R* to cash in on anyone dumb enough to pay for a la carte gun skins. So far the game has been available for everyone for only a week. They could have delayed it (online) even more, but instead released a version which isn't complete with a view to getting community feedback. I guess you can't please everyone. 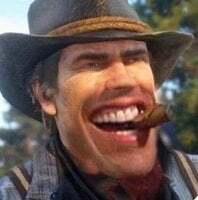 RDO and RD story mode are two separate entities, bundled together for free. So you can't compare story mode prices to Online. Some people like to earn their keep. Some like to pay. You aren't forced into either. This one place where buying something with real money makes no sense at all. Paradoxically, its reasonable for R* to cash in on anyone dumb enough to pay a la carte gun skins. Exactly. And it was identical to gun running research in GTAO. Either spend a ridiculous amount of time to research a hopefully good item or end up with a cosmetic (useless) skin. Or buy a shark card or two/three. I paid all my research with GTA $ from businesses, I didn't buy shark cards. I still got there in the end. And for what it's worth I had the worst luck with fast tracking research. The game is still in beta, they've already re-balanced the economy and given free money, and they haven't charged more than a normal game's cost, I think more reasonable expectations for a 2 week old experiance might help aid in your enjoyment. Research could be done in game without paying real money. If they had made the weapon skins in GR only obtainable by paying, I would have been perfectly ok with it. Especially if it made other research items less time consuming. I guess techincally you could grind gold bars in game. But the rate accumlated seems much more active and burdensome than even GR. How are they meant to make money if people don’t pay for something? Research could be done in game without paying real money. I researched without paying real money. I used in game money earned from businesses. I got what I wanted I left it at that. You're speculating. As the game is at the minute you can't buy gold and you can't earn enough gold "to buy the best horses and guns" without progressing beyond level 1. As long as it’s just a shortcut it’s fine. The problem is there if gold gives a permanent advantage, you cannot gain without spending gold. I don’t see that in the game.